We came here to have an experience to work. Our names are Yoshida and Iwamoto. We clean the guests room and help the front staffs' works every day. Today is the third day for us, and we have gradually accustomed ourselves to this job. However, working is harder and we get more tired than we thought. We think we must thank to our parents who work hard every day for us. Incidentally, our favorite Japanese foods are Sushi and Shabu-shabu. In NISHIYAMA RYOKAN, you can feel the "和" that is the Japanese spirit. Please come to NISHIYAMA RYOKAN!! 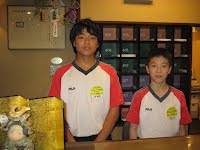 They are students from Shugakuin junior high school. They work here from this Monday to Friday for the challenge experience program of their school. They work hard and aspiringly each day. We hope they will learn and feel something about working through this experience.